Pain affects the quality of life for millions of individuals and is a major reason for healthcare utilization. As populations age, medical personnel will need to manage more and more patients suffering from pain associated with degenerative and inflammatory musculoskeletal disorders. Nonsteroidal anti-inflammatory drugs (NSAIDs) are an effective treatment for both acute and chronic musculoskeletal pain; however, their use is associated with potentially significant gastrointestinal (GI) toxicity. Guidelines suggest various strategies to prevent problems in those at risk for NSAID-associated GI complications. In this article, we review the data supporting one such strategy - the use of histamine type-2 receptor antagonists (H2RAs) - for the prevention of GI adverse events in NSAID users. Older studies suggest that high-dose H2RAs are effective in preventing upper GI ulcers and dyspepsia. This suggestion was recently confirmed during clinical trials with a new ibuprofen/famotidine combination that reduced the risk of ulcers by 50% compared with ibuprofen alone. It is estimated that at least 50 million people in the United States suffer from chronic pain conditions while an additional 25 million people suffer from acute pain . Pain affects patient quality of life and is a major reason for healthcare utilization , accounting for 20% of out-patient visits and 12% of all prescriptions . Non-steroidal anti-inflammatory drugs (NSAIDs) remain a main stay of therapy due to their efficacy as anti-inflammatory/analgesic agents. In 2004, persons in the United States spent more than $2.5 billion on over-the-counter NSAIDs and filled more than 100 million NSAID prescriptions . Worldwide, over 73,000,000 prescriptions for NSAIDs are written each year . While NSAIDs are effective for the treatment of pain and are overall well tolerated, their use is associated with potentially important adverse effects. Gastrointestinal (GI) toxicity from NSAIDs includes dyspepsia, ulcers and bleeding [6, 7]. Of individuals taking NSAIDs, the drugs produce symptoms of dyspepsia and ulcer disease in up to 50% and up to 20%, respectively . Approximately 15 to 30% of regular NSAID users are found to have gastric or duodenal ulcers on upper endoscopy and many of these ulcers are asymptomatic . While most patients who develop NSAID-induced ulcers do not develop clinical events, the annual rate of upper GI clinical events is approximately 2.5 to 4.5% . Epidemiologic studies suggest that NSAID use increases the risk of GI complications two to six times . GI toxicity from NSAIDs is associated with substantial morbidity and mortality. Reports in the literature estimate 3,200 to 16,500 deaths each year in the United States from complications of NSAID-associated ulcer perforations and bleeding [10–13]. Additionally, an estimated 100,000 hospitalizations occur each year in the United States due to NSAID-associated ulcer perforations and bleeding . Furthermore, the cost associated with complications of NSAID use is substantial. Studies suggest that for every $1 spent on NSAIDs, $0.66 to $1.25 is spent on managing NSAID-associated adverse GI effects [14, 15]. Any person taking NSAIDs is at risk of developing GI complications. Several well-established factors have been identified that significantly increase this risk. 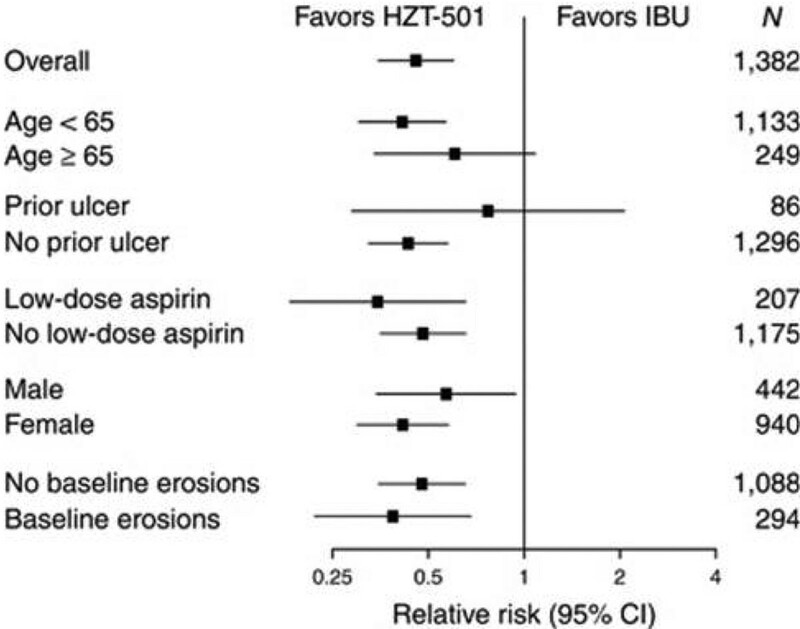 In addition to concurrent low-dose aspirin use, age >65, prior upper GI events, concomitant use of anticoagulation or corticosteroid therapy and use of multiple NSAIDs or high-dose NSAIDs have all been consistently shown to increase the risk of GI complications [6, 8, 16]. Current guidelines for the management of patients who need pharmacotherapy for treatment of pain both acknowledge the risk of GI clinical events associated with NSAIDs as well as address the factors known to increase the risk. Recommended strategies to decrease GI toxicity in NSAID users include co-therapy with misoprostol, histamine type-2 receptor antagonists (H2RAs) or proton-pump inhibitors (PPIs) and/or the use of cyclooxygenase-2 selective inhibitors [11, 17]. The American College of Gastroenterology recommends that patients requiring NSAID therapy who are at high risk should receive alternative therapy - or, if anti-inflammatory treatment is absolutely necessary, a selective cyclooxygenase type-2 inhibitor (coxib) and/or co-therapy with misoprostol or high-dose PPI is recommended . The First International Working Party on Gastrointestinal and Cardiovascular Effects of Nonsteroidal Anti-inflammatory Drugs and Anti-platelet Agents concludes that patients with high GI risk, but average cardiovascular (CV) risk, should receive either a nonselective NSAID plus a PPI or misoprostol, or should receive a coxib plus a PPI or misoprostol . The Health Technology Assessment's economic modeling in 2006 suggested that, with regard to the prevention of endoscopic ulcers, H2RA plus NSAID was a dominant, cost-effective option . Although subsequent to this report, less expensive generic and over-the-counter PPIs have become available that would reduce the cost of PPI gastroprotection considerably. There has not been a follow-up cost-effectiveness study incorporating lower priced PPIs nor are there head-to-head comparative studies evaluating efficacy of the competing strategies. H2RAs inhibit acid secretion by competitively blocking histamine type-2 receptors on the parietal cell, thus reducing basal and stimulated gastric acid secretion. Pepsin secretion is also reduced, which results in decreased peptic activity . PPIs instead block acid secretion by irreversibly binding to and inhibiting the hydrogen-potassium ATPase pump on the luminal surface of the parietal cell membrane. Absorption of H2RAs is reduced by concurrent antacid administration. Likewise, PPIs which rely on an activated parietal cell work less well in persons also taking other antisecretory agents such as misoprostol or an H2RA. The use of H2RAs can suppress gastric acid production by 37 to 68% over 24 hours . But H2RAs have not always been recommended for preventive therapy in NSAID users because, when given in standard doses, they do not significantly decrease the rate of NSAID-associated gastric ulcer formation. There does, however, appear to be a dose-response relationship between H2RAs and gastric ulcer prevention and healing. Both a meta-analysis and a Cochrane review found that standard doses of H2RAs were effective at reducing the risk of duodenal but not gastric NSAID-associated ulcers [21, 22]. The same Cochrane review concluded that high-dose H2RAs are effective at preventing chronic NSAID-related duodenal and gastric ulcers. Included in the Cochrane review are three randomized controlled trials with 298 participants that assessed the efficacy of double-dose H2RAs for the prevention of NSAID-induced upper GI toxicity. 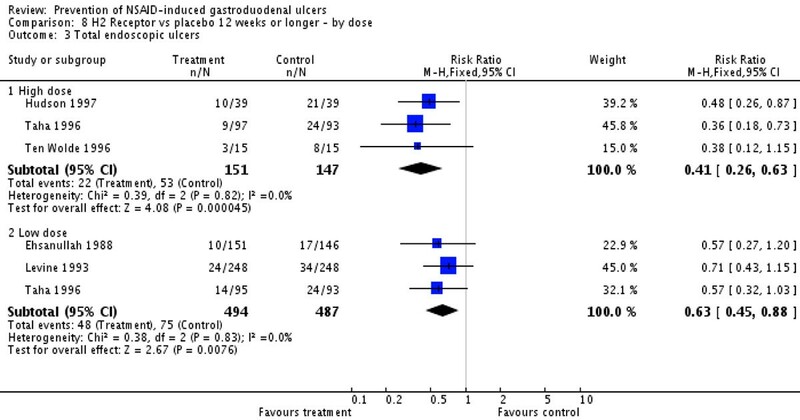 High-dose H2RAs were associated with a statistically significant reduction in the risk of both duodenal and gastric ulcers compared with placebo. Furthermore, high-dose H2RAs significantly reduced symptoms of abdominal pain compared with placebo . See Figure 1. Histamine type-2 receptor antagonists and prevention of NSAID-induced upper gastrointestinal toxicity. From  (Analysis 8.3). CI, confidence interval; M-H, Mantel-Haenszel. Results from a 24-week double-blind, randomized comparison of placebo versus low-dose famotidine (203mg twice daily) or high-dose famotidine (40 mg twice daily) prophylaxis against NSAID-associated gastroduodenal ulcers found that the incidence of gastric ulcers was 20% in the placebo group, 13% in the low-dose famotidine group and 8% in the high-dose famotidine group. Many of the patients enrolled in the study did not have abdominal pain or dyspepsia, but among those who did there was a trend toward reduction in dyspepsia in patients taking famotidine . 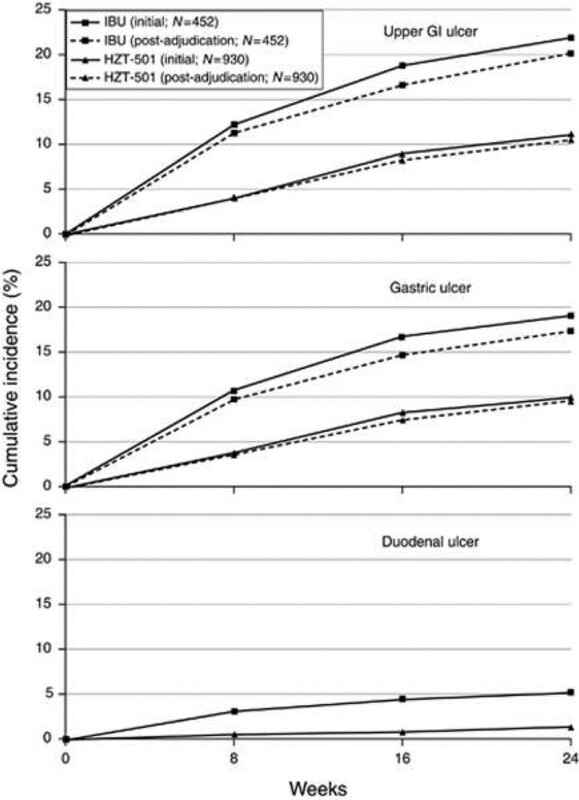 A follow-up study, which was also included in the Cochrane review, followed 104 patients with rheumatoid arthritis or osteoarthritis with known NSAID-associated gastroduodenal ulcers, and found that high-dose famotidine is effective therapy for ulcer healing and significantly reduced the cumulative incidence of gastroduodenal ulcer recurrence compared with placebo when given as maintenance therapy. All patients received 40 mg famotidine twice daily. Cumulative ulcer healing rates at 12 weeks were 89.0% for patients who continued NSAID therapy (88 patients) and 100% for those who stopped (16 patients). Patients with successful ulcer healing were then randomized to either 40 mg famotidine twice daily or placebo. The subsequent estimated cumulative gastroduodenal ulcer relapse over 6 months for NSAID users who took high-dose famotidine was 26.0% compared with 53.5% in NSAID users who took placebo . These findings were confirmed recently in two larger double-blind randomized trials comparing a ibuprofen/high-dose famotidine combination versus ibuprofen alone for reduction of NSAID-associated ulcers . See Figures 2 and 3. Incidence for ibuprofen/high-dose famotidine combination versus ibuprofen alone for reduction of NSAID-associated ulcers. From  (Figure 2). GI, gastrointestinal; IBU, ibuprofen. Comparison of ibuprofen/high-dose famotidine combination versus ibuprofen alone for reduction of NSAID-associated ulcers. From  (Figure 3). CI, confidence interval; IBU, ibuprofen. In a 2004 systematic review of five strategies for the prevention of gastrointestinal toxicity induced by NSAIDs, the authors identified 15 randomized controlled trials (including 2,621 participants) evaluating the effectiveness of H2RAs. In total, only a single serious gastrointestinal event, one symptomatic ulcer, one death and four CV events were reported. There were no data on health-related quality-of-life measures and no conclusions could be made on the effect of H2 receptor antagonists compared with placebo with respect to any primary outcomes. However, endoscopic ulcers were significantly reduced in subjects receiving H2RAs compared with placebo (relative risk = 0.55, 95% confidence interval (CI) = 0.4 to 0.7) . Similar conclusions were reached by Rostom and colleagues in their 2009 review of cyclooxygenase-2 inhibitors and NSAIDs plus gastroprotection in preventing GI toxicity. They noted that misoprostol, PPIs and high doses of H2RAs are all effective at reducing the risk of both endoscopic gastric and duodenal NSAID-induced ulcers, while standard doses of H2RAs are not effective at reducing the risk gastric ulcers but do reduce the risk of duodenal ulcers . One should note that studies directly comparing high-dose H2RAs with PPIs or misoprostol for preventions of NSAID-associated upper GI lesions are not available. Likewise there are no prospective studies evaluating the effectiveness of H2RAs in preventing serious NSAID-associated complications, although H2RA use on a population level appears to reduce the risk of NSAID-associated GI bleeding . There are currently four H2RAs available in the United States: cimetidine, ranitidine, famotidine, and nizatidine . At present, there are also three combination products aimed at decreasing the risk of NSAID-associated GI complications that are approved for use in the United States. Each of these combinations - diclofenac and misoprostol, naproxen and esomeprazole, or ibuprofen and famotidine - has been shown to have lower incidence of GI toxicity than its NSAID component alone . For example, HZT-501 is a fixed-dose combination of 800 mg ibuprofen and 26.6 mg famotidine available in the United States. Two large, double-blind randomized trials, REDUCE-1 and REDUCE-2, demonstrated that high-dose famotidine plus ibuprofen, given as a combination tablet, decreases endoscopic upper GI ulcers as compared with ibuprofen alone by approximately 50% during 6 months of treatment. This degree of ulcer reduction was also seen in patients taking concomitant low-dose aspirin. Like the many studies included in the Cochrane review, both of these REDUCE trials use endoscopic ulcer prevention as a primary endpoint; there is some uncertainty as to how this translates to clinical outcomes such as serious GI complications, although there was also significantly less dyspepsia noted with combination therapy compared with ibuprofen alone. While there was a positive trend favoring combination famotidine/ibuprofen therapy, neither study showed significantly lower incidence of upper GI ulcer in patients with a history of ulcer disease since the total number (6%) of such individuals enrolled was small . Combination therapy is appealing as adherence to pharmacotherapy is improved when one pill rather than two is required . This holds true for patients started on two medications, for patients having a second medication added to their one-drug regimen, and when patients already on a two-drug regimen are switched to a fixed-dose combination. Compliance improves from 37% to 50 to 67%, from 54% to 77%, and from 71% to 84%, respectively, for each scenario . Despite guidelines recommending gastro-protective therapy for NSAID users, <50% of NSAID users with GI risk factors are prescribed protective co-therapy even with educational reminders and when cost is not an issue . Poor adherence to gastro-protective co-therapy in NSAID users is associated with increased risk of GI complications. A nested case-control study that analyzed information from 618,684 NSAID users from the General Practice Research Database in the United Kingdom, the Information Database in the Netherlands, and the HealthSearch/CSD Longitudinal Patient Database in Italy showed that nonadherence to gastro-protective agents (defined as patients with <80% adherence) is associated with a 2.4-fold increased risk of upper GI bleeding and ulcers, and with a 1.9-fold increased risk of upper GI bleeding alone . A disadvantage to combination therapy is cost. Branded combination products are at least four or five times more expensive than the individual generic components. An additional disadvantage of the H2RA/NSAID combination or the misoprostol/NSAID combination is that misoprostol and H2RAs including famotidine are not as effective as PPIs (H2RAs) or are not indicated (misoprostol) for the treatment of gastroesophageal reflux disease (GERD). Thus, many patients who are already taking PPIs for GERD will be unable to switch to H2RA/NSAID or misoprostol/NSAID combination therapy to treat both GERD and pain requiring NSAIDs . A fixed combination also limits the choice of the anti-inflammatory component, which is an issue for some patients who are intolerant or refractory to a particular drug. Misoprostol is a prostaglandin E analog that has been consistently shown to decrease the risk of NSAID-associated gastric and duodenal ulcers and their complications. Misoprostol is available as monotherapy (200 µg four times daily) or as combination therapy with diclofenac (200 µg misoprostol and 50 or 75 mg diclofenac twice daily) . A large randomized controlled trial that included 8,843 patients with rheumatoid arthritis receiving chronic NSAID therapy assigned to 200 µg misoprostol four times daily versus placebo found that misoprostol reduced serious NSAID-induced upper GI complications by 40% compared with placebo . While effective, the use of misoprostol is limited by poor tolerability. One should note in the previous study that significantly more patients in the misoprostol group than the placebo group withdrew prematurely from the study due to side effects such as diarrhea, cramping and flatulence . Another large prospective, double-blind multicenter study found that standard-dose misoprostol was superior to PPIs such as lansoprazole for the prevention of NSAID-induced gastric ulcers, but when poor compliance and potential adverse effects associated with misoprostol were considered the PPIs and misoprostol were clinically equivalent . The lower 400 µg total daily dose of misoprostol recommended for the combination diclofenac/misoprostol formulation may not be as effective in preventing GI mucosal damage and is still associated with significant side effects. Use of misoprostol in women of childbearing potential is also problematic due to its abortifactant properties. PPIs are also effective gastro-protective agents, and esomeprazole is also available in combination therapy with the NSAID naproxen. The concurrent use of a PPI in patients taking chronic NSAIDs has been shown to significantly decrease the risk of endoscopic ulcers . While generally safe, concerns regarding long-term PPI use have been identified by the US Food and Drug Administration and other regulatory agencies. For example, PPIs have been associated with an increased risk of fractures. A case-control trial suggested that long-term PPI use was associated with an increased risk of hip fractures in persons over the age of 50 and the magnitude of the risk increase was proportional to both the dose and duration of PPI therapy . Another safety issue reported with PPI use is increased risk of Clostridium difficile colitis . Furthermore, there are concerns about PPI interactions with other commonly prescribed medications, most notably clopidogrel . While controversial, there are data to suggest that inhibition of platelet aggregation with clopidogrel is significantly decreased in patients on concomitant PPI therapy [39, 40]. The US Food and Drug Administration has issued a public health warning on the possible interaction between clopidogrel and PPIs - specifically omeprazole and esomeprazole, the latter being the PPI component of the available prescription PPI/NSAID combination  This same warning applies to the H2RA cimetidine, but not to other H2RAs. Substitution of a coxib for a NSAID has also been shown to decrease the risk of GI toxicity. A Cochrane meta-analysis that compared the GI safety of coxibs with NSAIDs concluded that coxibs were associated with significantly fewer gastroduodenal ulcers and fewer ulcer complications (including perforation, obstruction and bleeding), as well as fewer treatment withdrawals caused by GI symptoms when compared with nonselective NSAIDs . However, an increased risk of ischemic CV disease has been described with the use of coxibs [43, 44]. Most recently, a systematic review of community-based, controlled observational studies found that the relative risks for CV events were 1.45 for rofecoxib (95% CI = 1.33 to 1.59), 1.17 for celecoxib (95% CI = 1.08 to 1.27), 1.18 for ibuprofen (95% CI = 1.11 to 1.25) and 1.09 for naproxen (95% CI = 1.02 to 1.16) . Concern for CV toxicity has led to decreased usage of these agents. After market withdrawals, celecoxib is currently the only coxib available in the United States . Concern was raised recently about the potential CV risk of both selective and nonselective NSAIDs since these drugs appear to increase the risk of subsequent cardiac events following a myocardial infarction . Tolerance to H2RAs has been reported to develop after as few as 7days of therapy . The clinical relevance of tolerance has not been established for NSAID gastro-protection as opposed to GERD treatment, but it may pose some limitations for long-term use of H2RAs for NSAID gastro-protection. Tolerance does not occur with PPIs. Despite this potential limitation, H2RAs alone or as a combination H2RA/NSAID formulation do offer some potential advantages over the other strategies for gastro-protection. H2RAs are well absorbed after oral dosing, and while absorption is reduced by concurrent antacid use, it is not affected by food. This obviates the need for meal-related dosing, which is necessary with PPIs especially when treating GERD. While this dosing flexibility is advantageous, perhaps the most beneficial quality of H2RAs is safety. Generally speaking, H2RAs are safe drugs. In clinical trials, the frequency of adverse reactions from H2RAs is similar to that for placebo . Unlike PPIs, available data suggest no significant interaction between H2RAs other than cimetidine and clopidogrel . Of the four H2RAs available in the United States, cimetidine may interact with drugs metabolized by the cytochrome P-450 pathway and may therefore decrease the biotransformation of clopidogrel by competitive inhibition of CYP2C19. However, there are no controlled studies to demonstrate this effect. Ranitidine interacts weakly with cytochrome P-450, and nizatidine and famotidine do not bind to cytochrome P-450 and thus have a low potential to interact with clopidogrel . There are no randomized trials directly comparing gastroprotection of H2RAs with PPIs in patients with CV disease taking antiplatelet therapy, but observational data suggest PPIs may be more effective than H2RAs in prevent ing upper GI bleeding. Consensus guidelines from the American College of Cardiology Foundation/American College of Gastroenterology/American Heart Association, however, recommend H2RAs as an alternative to PPI therapy in patients taking clopidogrel who are at lower risk of GI bleeding . Likewise, H2RAs are not significantly associated with the increased risk of fracture that is seen with PPIs. A recent meta-analysis found that long-term use of PPIs increased the risk of any fracture (adjusted odds ratio = 1.30; 95% CI = 1.15 to 1.48) and hip fracture risk (adjusted odds ratio = 1.34; 95% CI = 1.09 to 1.66), whereas long-term H2RA use was not significantly associated with fracture risk . Finally, the increased risk of pneumonia and C. difficile colitis is lower in patients taking H2RAs compared with patients taking PPIs [51, 52]. NSAIDs are effective treatment for acute and chronic pain; however, they are associated with a risk of potentially serious GI complications. NSAID use is expected to increase in the coming years because the world population is aging and age is a significant risk factor for chronic pain . Older age is also a significant risk factor for NSAID-associated ulcers and bleeding. This highlights the necessity for prophylactic treatment to prevent GI complications in NSAID users. H2RAs are generally safe agents and, when given in high dose, are effective for the prevention of upper GI ulcers and dyspepsia in chronic NSAID users. Administration of a formulation that combines both the H2RA famotidine and the NSAID ibuprofen offers a convenient and well-tolerated means to manage signs and symptoms of arthritis and other chronic painful conditions and at the same time reduce NSAID-associated dyspepsia and ulcers. NSAID-associated GI complications continue to be a substantial cause of morbidity and mortality. Patients at risk for NSAID-associated ulcers should be identified and offered concurrent gastro-protective therapy. High-dose H2RAs are an effective, safe, well-tolerated and economically sound strategy for the prevention of NSAID-associated gastroduodenal ulcers. The combination of high-dose H2RA (famotidine) plus a NSAID (ibuprofen) offers an effective and convenient means for treating pain while minimizing GI toxicity. DP has received consulting and or speaking fees from Astra Zeneca, Pfizer, Horizon, and Takeda. AT declares that she has no competing interests.